In case you don’t have an FPB anchored nearby, we’ve included below some brief comments from several of our owners, as well as a couple of hard-nosed magazine editors. 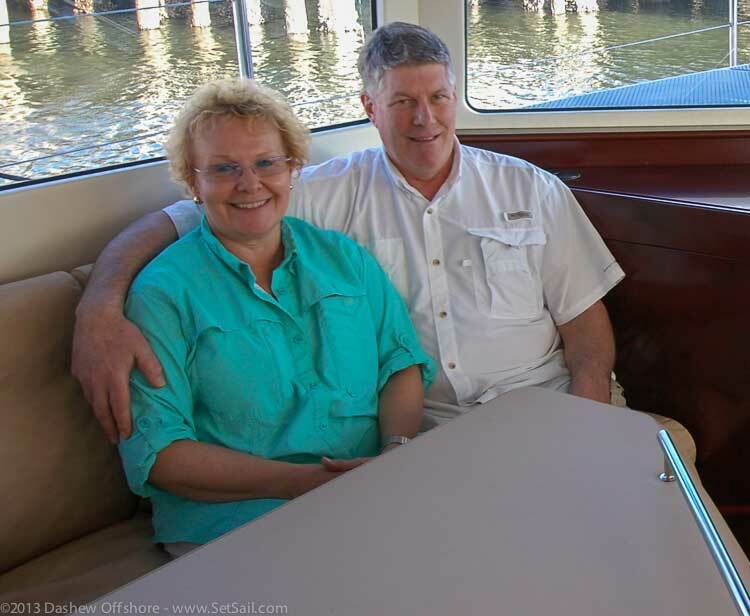 We’ll start with Bill Parlatore, the individual many credit with the start and nurturing of the ocean cruising powerboat industry. Bill Parlatore, founder and editor of Passagemaker Magazine, helped push us into exploring what became the FPB concept. 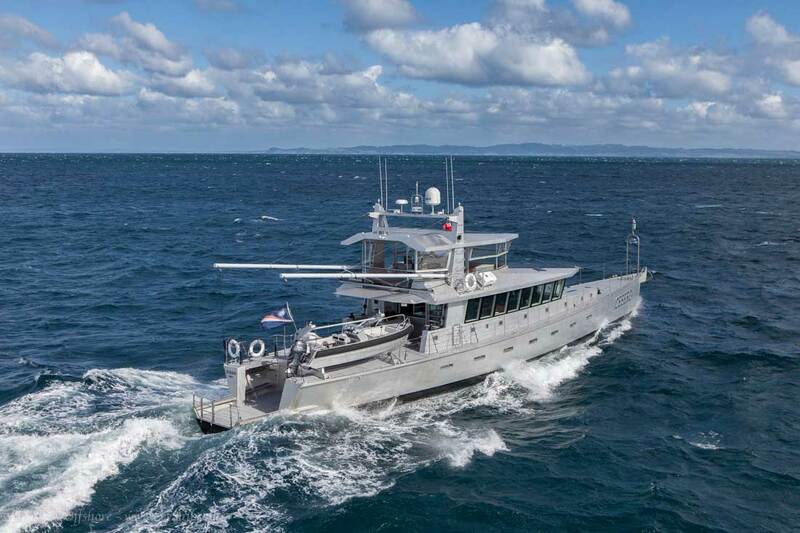 Bill flew down to Auckland, New Zealand, during sea trials on the FPB prototype Wind Horse, to see her in action. You can read his very detailed article, which appeared in the December 2005 issue of Passagemaker Magazine. In the meantime, here are a few excerpts from his extensive comments. I can’t recall another time where a crew (including the on-watch helmsperson) could enjoy a dinner together—in the saloon rather than seated around a cramped pilothouse. 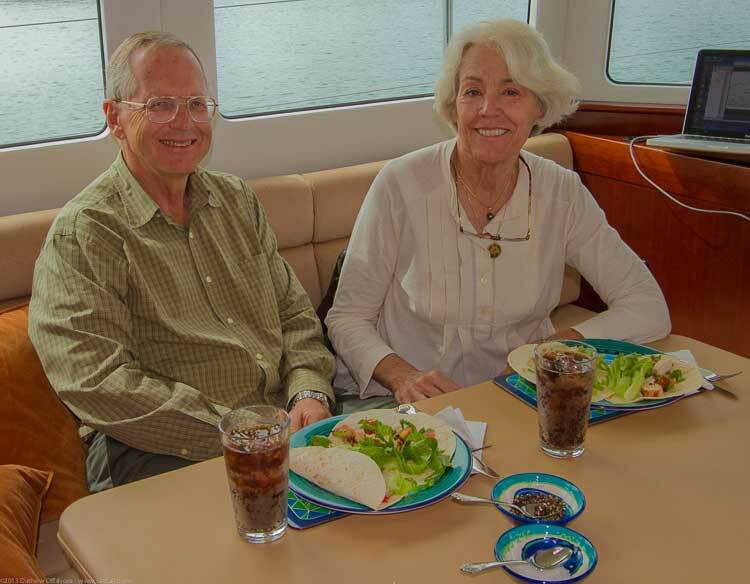 Instead of carrying plates, flatware, drinks, napkins, and all the food dishes up a set of steps to the helm area to eat together around the typically small, fixed table behind the helm, crew can spread out around a large dining table in the saloon. Instead of balancing plates on knees on a settee or watch berth, this is real seating at a dining table—a feature that has much to recommend it. And, of course, the best part is that at sea, this central living area doesn’t change attitude or have much motion. 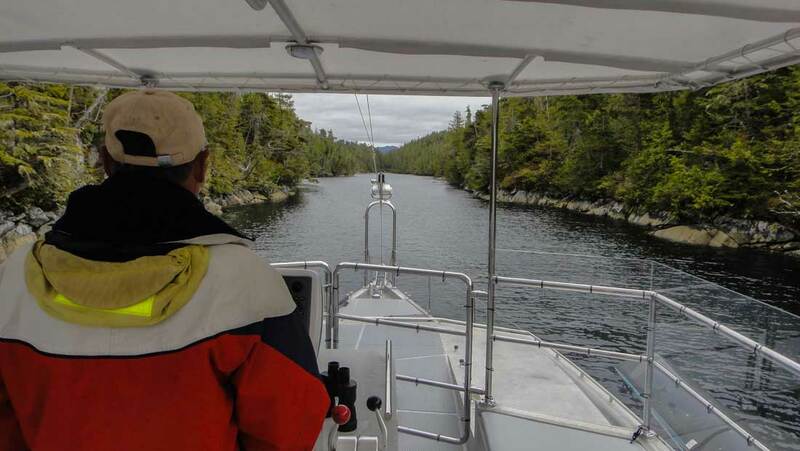 After a night on the hook in Bon Accord Harbour, we ran up to Barrier Island to look for some nasty sea conditions. I witnessed first hand how well the boat handles up-swell at various speeds. With no serious penalty in speed, the boat just danced over or through the waves, never showing any tendency to stop in her tracks, as so many other boats do. In seas where most traditional trawlers would reduce speed to 6 knots or less, we found absolutely no reason to do so. Even at full throttle and 12-plus knots, the boat didn’t seem affected by the up-swell challenge—giving up maybe two thirds of a knot. I wish I could put into words the feeling of running the boat, gliding along the face of the larger swells so effortlessly without any feeling of the acceleration in speed. The max speed on the GPS ended up at 13 knots, but you would never know it sitting in the boat. I just couldn’t get enough as we kept looking for the larger swells off in the distance, hoping they would catch us and let us experience more of the surfing from a totally different perspective than we have ever experienced. Our boat feels like it is so slippery, and once the large swells move towards the boat off it goes, straight as an arrow sliding along the face of the swell, just like a surfer finding the perfect wave. Before Tiger, Sandy HATED going to sea. Now we both look at a 500 mile nautical passage like crossing the street. The boat doesn’t tire you out. Efficiency, low maintenance, clean lines, practical applications (counter tops) are most important to me. With this boat I have it all. The cabinets are a beautiful design and extremely easy to maintain. I love being able to open cabinet doors and leave the entire galley cabinetry wide open–easy to get and use what I need. The location of the washer and dryer is just too perfect…This boat is a perfect two person boat for handling and maintenance. No fiberglass to polish, blast it with a pressure washer and you are back in business! Not having to think and worry about finding a crew every time you move the boat is a dream. But if you want crew help, you have a place for them to sleep. The 360 degree vision in the main salon area is a conversation piece. Impresses everybody. Now for a few thoughts on the trip from an ex-sailor’s perspective. The journey of 900NM would normally have been planned at six knots in our old yacht, thus making it a six day affair and needing a larger weather window to make this passage in winter into New Zealand. On that boat, we had a fuel range of around 600NM, so the planning is that much more difficult, as you are looking for wind but not too much and of course in the best direction. The forecast we left in would not have been doable, as winds were generally light and we would have taken much longer than six days, even with motoring, and the risk of encountering nasty weather would have risen substantially as we approached New Zealand. Having said that, of course there are many yachts making the same journey every year from the tropics, but generally arriving late spring when weather is beginning to improve and frontal systems may be a little less frequent. Knowing that with our powerful engine and easily driven hull we could make this passage in four days took a lot of pressure off the weather. However, we still needed to speed up to beat the large eight+ meter swells coming north up the Tasman towards us, and avoid the two 40+kt gales that occurred either side of our arrival into Opua. Weather on passage itself was benign, seas less than 2.5m and light winds but lots of rain and cold, grey skies. Our old yacht had a sprayhood and bimini, but we would have been sitting out in the wet and cold everyday. Nights are longer than days at this latitude and time of year, so we remarked on several occasions how miserable it would have been sitting in the cockpit. On the other hand watches, especially at night on our FPB, are generally very comfortable affairs. A warm cozy ambiance, comfortable helm chair or settee and with the benefit of large displays showing radar, with guard alarm set, Flir camera showing outside as if it were broad daylight and engine camera cycling. Frequent weather downloads from the VSAT or pactor 4 modem through the HF and good WX fax downloads directly onto the Furuno going on quietly in the background all help to make the passage go smoothly. With three on board we ran three hours on, six hours off watches, and made an engine room inspection at each handover. The aft deck floodlight made a visual inspection of the seas, which were mostly following, easy to do at night from behind the closed main door. The pleasure in Grey Wolf is that there is virtually no rolling with the active stabilizers, but it is noisier than moving along at night under sail. 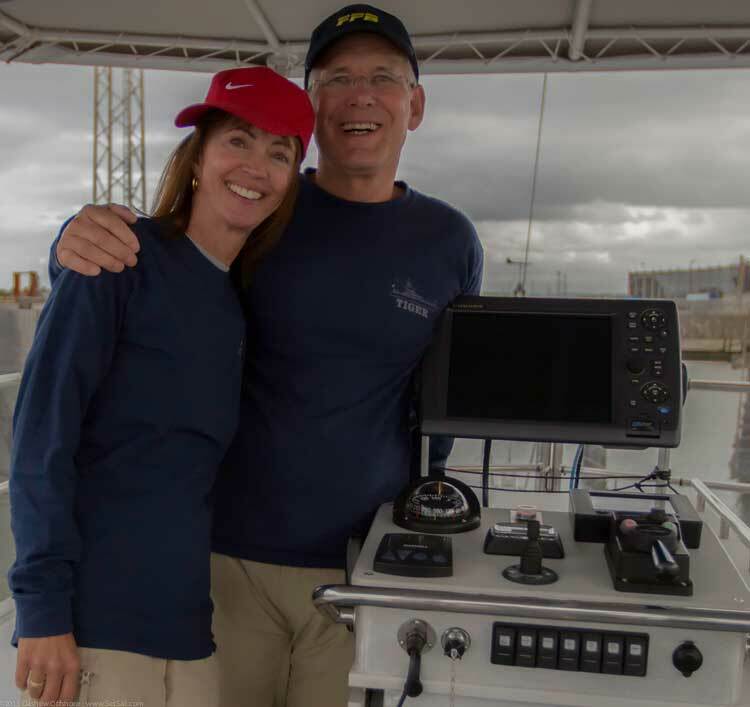 For one we are moving quicker through the water at 10+kts for much of the time, and the engine revs vary (as they do on a sailboat) when accelerating and then slowing on following waves, making sleep sometimes not as easy as on a sailboat under sail. On an FPB versus a sailboat it is very easy to become more detached from the surrounding environment and somehow have less awareness of the wind and waves if one is not out in the open and as close to the water. Being on the fly bridge, higher up though has proved to provide a perfect vantage point to see wildlife such as dolphins, whales, sharks etc. There are still tasks to perform on a power driven vessel just as on a yacht, moving the boom lines a few inches everyday to prevent chafe and making deck checks etc, but not having the constant trimming of sails, especially when squalls and showers come through, reduces the stress and workload levels enormously. … Our friends, yes they were impressed. They loved the way the boat handled the seas. From what he knew after following your blog, he expected the ride to be superior. What struck him most on the passage was the speed. I don’t need to tell you, there’s a bit of a myth going on about running speed in the trawler market. Our 53′ waterline trawler was billed as having a cruising speed of 10 knots… and a range of 2500 miles. This is typical hype and of course ludicrous. Ten knots is closer to maximum speed; one can easily cruise at 8-8.5 knots if fuel efficiency is not a big priority, and that is comfortable and good for engine loading. But the 2500+ NM range applies only at speeds of 5.75-6.5 knots, still leaving zero fuel reserve on a Pacific crossing. So in a Pacific crossing, for example, you are going very slowly, making for a longer passage, with heavy fuel bladders on your deck. And at those speeds, stabilizers don’t work very well so you get to roll more. Add to that the fact you are being too stingy with your fuel to run your generator: on most (but not all) of these boats, air conditioning and/or laundry are generator dependent. Hot, dirty, sweaty, nauseated… let’s see, have I forgotten anything? Oh yeah, also swearing a blue streak because weather you had no ability to avoid is turning to s—t. So for him to see and experience “BN” plugging along at 10 knots, being pretty fuel efficient and able to gallivant all over, avoiding unpleasant conditions, really hit home. We all know the speed/range thing is misrepresented by all these trawler names, so it was just surprising for them to realize that we really and truly were going to do our passage at nearly 10 knots and still have plenty of fuel for our season and return passage. We diverted northwest instead, to stay on the ‘correct’ side of the low. This put the wind and seas more behind us, so although we had winds in the high 30′s, and big seas, they were manageable. We were able to do this because we have a boat that moves fast enough to employ such tactics when needed. Several slower sailboats got caught out southeast of this low, and had the same 18 foot seas and 40 knots of wind right on their noses. They sounded truly exhausted when we heard them on the SSB radio net at the end of the day. The storage space on the FPB is deceptive, because we’ve got window space all around where I used to have above counter lockers, high lockers mounted on the bulkhead. So I thought, oh I’m going to be missing all that, and it actually turns out that you not only get all the great windows and the view, but I have at least as much storage space. It’s just very well designed. I didn’t have to sacrifice anything. And I love the induction cooktop. So the galley’s worked out really well, plus the great room is wonderful. It makes entertaining very convivial, because everything is right there in the same room. It goes perfectly with our style, you never feel isolated in the galley. Deb and I have known each other for 50 years (much as I hate to say that since it dates us). We have been boating for virtually all of that time, starting with a 16-foot Thompson lapstrake runabout with a tired 40 HP Johnson outboard. Over the years, we have worked our way up the food chain. There was a 19-foot Flying Scott daysailor, another 18-foot runabout with a 150 HP Yami. From there, Deb’s parents got a place in Florida and we bought a 22-foot Grady White cuddy, and blasted up and down the west coast of Florida. A friend of ours had a 48-foot Viking, and after a few trips to the Bahamas with them, we were bitten by the bug for something bigger and more capable. Our next move up was a 20-foot Blackwatch sportfish with twin Cummin’s diesels. Sporting a C Raymond Hunt hull, it was a very capable and fast offshore boat, great for a couple of guys for a weekend, but short on amenities for a family (read, Debby). So the Blackwatch went to the big boatyard in the sky as a trade-in. Its replacement was a 36-foot Egg Harbor, which upped the game with aircon, a real stateroom, a head with stall shower, a legitimate galley, and a couch that turned into a foldout double in the salon. Nice boat for the Florida and the Bahamas but really didn’t satisfy our growing desire to go further. With the fuel burn on the Egg, we learned the old adage that you can go fast or you can go far, but you can’t go far fast. So we made the leap up and decided to slow down with a pretty, customized Nordhavn 50. 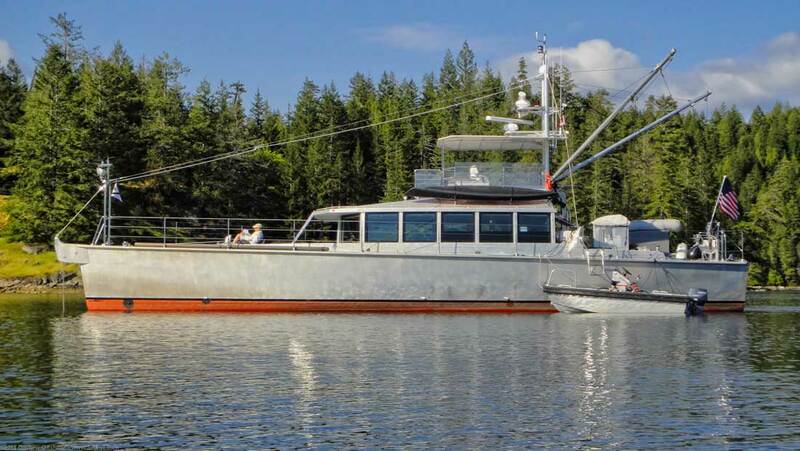 We owned the Nordhavn for 10 years, and found it to be a capable near shore cruiser with lots of space and comfort features. We also learned, however, for a variety of reasons that it wasn’t the boat to take us to far destinations – at least as far as we were concerned. I had been following the exploits of Steve and Linda for years aboard their sailing vessels, but sail was just not our thing. We were intrigued by Wind Horse, but at that time, there were no other Wind Horses to be had. Then we learned about the 64 program, and I was off to England for a ride on Wind Horse on a typically nasty day off the Needles on the Solent. I was hooked, and it wasn’t long after that I signed on the dotted line for FPB64-3. 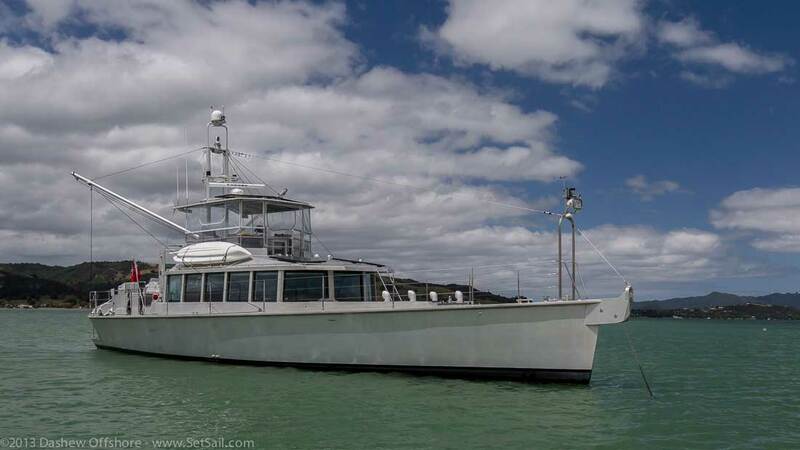 Time passed, the Nordhavn was sold, and we took delivery of Iron Lady in Whangarei, New Zealand in February of 2011. Since then, we have crossed oceans and gone places that most people can only dream of, with Iron Lady as our magic carpet. Year one was New Zealand, Tonga and Fiji. Year two was a complete circumnavigation of both the North and South Islands of new Zealand. In 2013, we departed New Zealand for the 2300 nautical mile passage to French Polynesia, where we spent three months exploring the Societies, Tuamotus and Marquesas before heading north across the equator to the Line Islands, Palmyra and Hawaii, where Iron Lady rests comfortably waiting for next spring and our departure to Kodiak, Alaska. We intend to spend the summer exploring Prince William Sound before heading to Vancouver. In all, some 18,000 nautical miles have passed beneath Iron Lady’s keel in three years of part time cruising in some of the more legendary waters of the world, including the Southern Ocean, the Tasman, Foveaux Straight and the long ocean passages from New Zealand to French Polynesia and Hawaii. The more we cruise, the more we are in awe of her capabilities – and that cannot be said about many of those who claim the same capability. The Maretron indicates 13,268NM, but if the input is from the “speed through water” paddle wheel, (which often is interrupted by debris) this is not accurate. If we use the engine hour meter (1953 hours) and if our average cruising speed is 9.5kt, then we’ve traveled over 18,500NM. Take your pick. We’ve enjoyed every NM! That is Bill above conning Sarah Sarah. With this boat, it’s not that we would just go out willy nilly when the weather is really crummy, but I don’t get as concerned when they’re talking about–maybe it’s going to blow a gale or whatever…It’s like, well okay, if it starts to kick up we’re going to be fine. …[Sarah Sarah] is also easier to heat, better insulation, more efficient heating systems. We used to not want to go north during winter for cruising; now we don’t hesitate to go somewhere, say British Columbia for New Year’s, even though we know it’ll be freezing, because it’s so cozy and spacious inside. There are bigger windows, a better view, a better sense of space inside so we don’t feel trapped in bad weather. The open interior is much nicer than expected, such a great contrast between the exterior. Now it makes our old Grand Banks interior seem busy and clunky, and most other boats too. 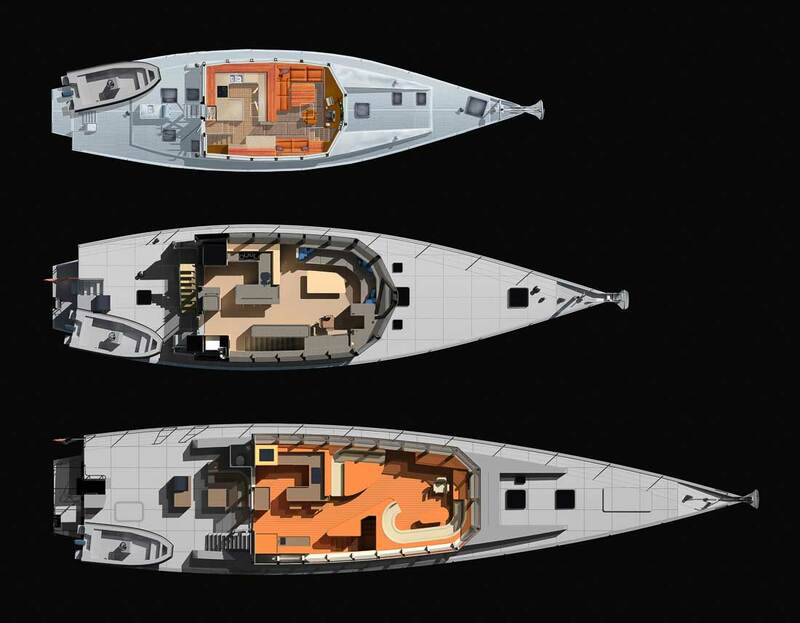 The fact that it has a big aluminum heavy duty hull is a great confidence builder. We don’t have the fear of smashing the fiberglass into the dock type of thing. I’m all for that aluminum hull. We just tell anybody who’s coming alongside, well we’re not worried about you but you might worry about us. Also, the boat is fantastic for diving, snorkeling, with the stern extensions. Makes it so easy to jump in, climb out, have elbow room, put your flippers on and stuff. And for us, it’s absolutely an incredible way to scuba dive. A lot of times we dive out of the dinghy, but if we have the right scenario we’ll dive right off the boat. And you can just use the stair step to have someone help balance the tank, and you walk three steps and jump in the water and there you go. 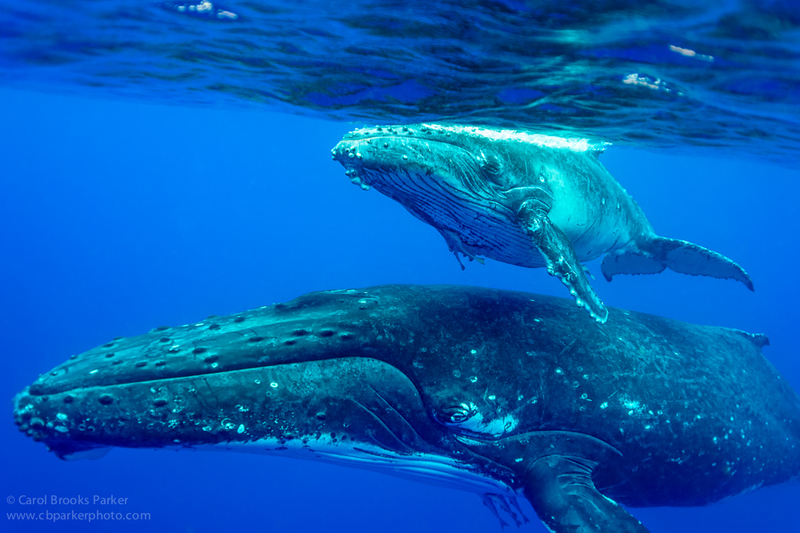 Carol captured the stunning photo of a mother whale and her calf after sliding off the swim step and into the water for an underwater visit in Tonga. Peter Watson is a Channel Island (United Kingdom) resident, and as such has messing about in boats in his blood. He has a love of the high latitudes, an affliction we share with him. 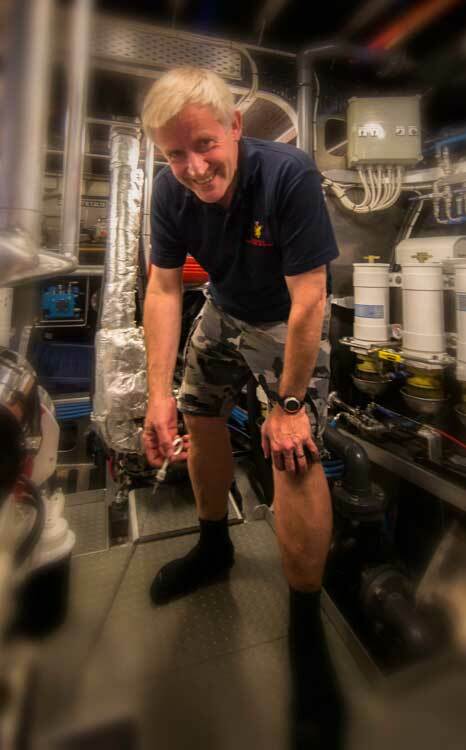 As an electrical engineer, with a Royal Navy background, like our other clients he is detail oriented. Peter comments from New Zealand where he is getting ready to depart for the UK via Panama. I started looking for a power boat five years ago; I knew what I wanted but thought it did not exist. Necessary features included: range to cross oceans, stability for comfort and safety, and the ability to be confident in taking the boat anywhere in any weather. Some of my most enjoyable boating has been done in the Arctic, in countries like Norway, Iceland and Greenland, where these factors can make a life or death difference. A naval architect friend suggested that I look at the FPB series (until then I had been looking at well known trawler brands but was not impressed by the comments that had come back from owners about range and stability in bad weather). 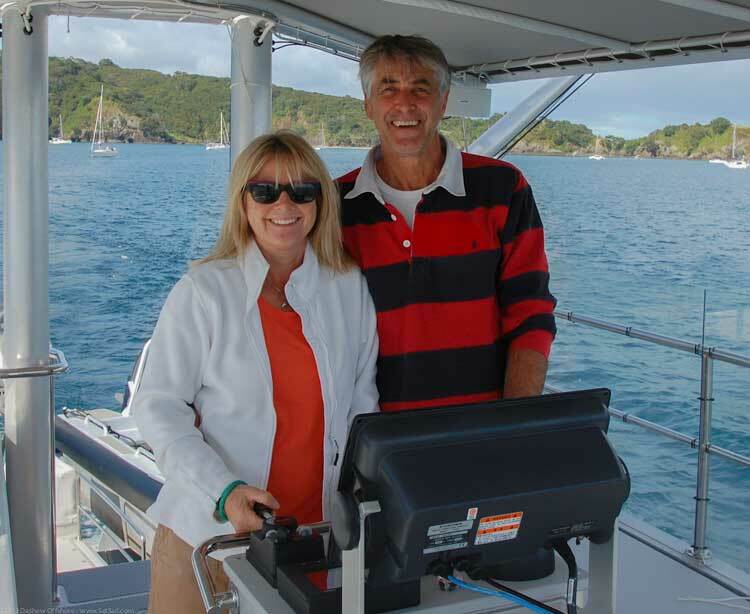 I started to talk with Sue Grant at Berthon (the UK agents) and Todd Rickard about the boats, along with current owners. I loved their honesty about what the boats could and couldn’t do. After these discussions went on for a couple of months, I decided to fly down to New Zealand to look at one. I was delighted, and what’s more the yard was so good I ended up buying a 64 as an interim to taking delivery of FPB 78-2. Although I have just had my FPB 64 since last fall, and have not yet put many miles on her, I have had the pleasure of going to sea in force eight conditions (strong gale), which felt like sea state two 0r three. Our upcoming passage back to the UK via Panama- 13,000 nautical miles – should get our mileage totals up where they belong. The Dashew team and the yard, along with Berthon, have been great to work with, and the thing that is so unusual is the honesty and openness about everything. You feel in the end that you have joined a family. The British press have a reputation for aggressively critiquing yachting products. When the leading British motor yachting magazine, Motor Boat & Yachting, asked to review the FPB prototype Wind Horse while she was in the UK, we were advised to politely decline the opportunity. However, we thought it would be interesting and educational to get their perspective on our design. You can read the resulting article by clicking here. A couple of comments from the review are included below. …a hugely impressive sight to boot. Moored amongst the glittering GRP at Berthon’s Lymington Marina on a sunny but very windy day, Wind Horse looked like it had come from a different planet. The 83ft-long (25m) wave-piercer weighs in at 41 tonnes, and could easily be mistaken for the spawn of the Royal Navy with its unpainted battleship grey, all-aluminum body. But that day, in those conditions, it was the only boat that I would have wanted to climb aboard to face the English Channel. Steve suggests that we head ten or 20 miles out into it to find the biggest waves we can in order to show off Wind Horse’s talents. In fact, the area around the Needles Channel and Hurst Spit is rough enough, with the tide being funnelled into the Solent in the blow. We find plenty of big waves. Our photo boat – a Windy 42 Bora (and a very good sea boat) – is tossed around like a bath toy, but Wind Horse just brushes through the crests with laughable ease. In fact, there was more pitching fore and aft than I would have imagined, but in terms of rolls, which is far more uncomfortable for those on board, the boat was reassuringly composed. “The sea really isn’t big enough,” Steve complains. “She works best in much bigger waves. This wavelength is far too short for her.” And so begins the hunt for the worst the sea has to offer. I have never been on a boat before where you stand in the wheelhouse directing the skipper to the place where you can see the most white horses and the biggest breakers, but this is clearly no ordinary boat. In a typical motor boat and in these conditions you would be white-knuckled, clutching a handhold and making sure you didn’t bite your tongue off. On Wind Horse, however, things are so stable that Linda can brandish a chunky bread knife and calmly cuts the freshly prepared sandwiches in half. Sue Henry took this lovely anchored photo of Sarah Sarah from her kayak. That’s Bill on the foredeck, studying his owner’s manual. We don’t build a lot of boats. Just a few each year. We don’t want to be the biggest, just the best. 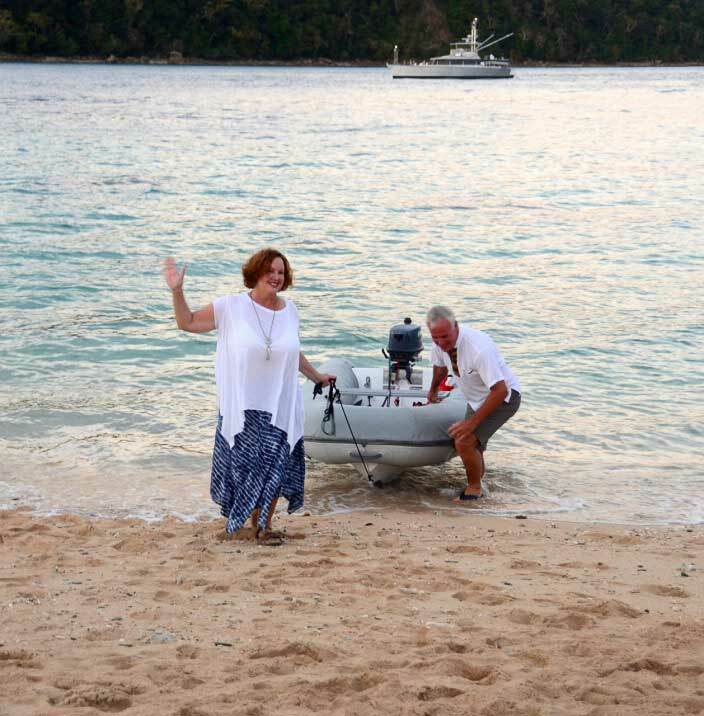 If you’d like to find out more, talk to one of our owners – you will find them out cruising. Or, get in touch with Sue Grant: Sue.Grant@Berthon.Co.UK. If you want to read more of what the international press has to say about the FPB concept, click here to read new articles. There are hundreds of posts detailing the FPB concept, including design, construction and cruising with FPBs on the SetSail site, some of the more popular of which are listed below. For more information, contact Sue Grant: Sue.Grant@Berthon.Co.UK. Three of the owners quoted above have websites. You will find links to them below. This entry was posted on Saturday, January 17th, 2015 at 1:15 pm and is filed under Dashew Logs, Favorites, Intro to FPB Program, Most Popular, one. Both comments and pings are currently closed. You all really have an eye for some beautiful photography. My partner & I think of your boats like spaceships for exploring earth. They protect you & provide comfort in the most hostile of environments. There is something very comforting about that. We don’t have the physical ability to battle the elements. Not that I would want to even if I could. We need a boat that will do that for us. We need a safe, comfortable home that will carry us to all corners of the earth in safety & without drama. Your designs are the best things we have seen that can do that & we truly hope to own one eventually. Your goals are the same as ours. I’m glad Sarah likes the picture of Bill lounging on the foredeck of “Sarah-Sarah”. It was indeed taken from Sue’s kayak, however, I was the photographer. Aren’t the boats lengthened, i.e. the 97 is 110 feet? What is the LOA (incl swim step) now on the boats. Do the deck plans reflect the previous or the present lengths? Hi Will. Yes, the overall length of the FPB’s, inclusive of swimstep extensions – 68.4′ (FPB64), 85.63′ (FPB78), and 110′ (FPB97). Another example of delivering more than expected!